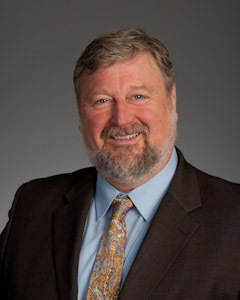 Professor Glen-Peter Ahlers joined the Barry Law faculty in May 2002. He served as Associate Dean for Information Services until August 2010, overseeing the law library and technology functions on campus. Professor Ahlers has worked in all types of libraries, beginning with a stint as a student assistant in the second grade. Professor Ahlers directed law school libraries for more than 20 years before moving to the full-time teaching faculty. Before arriving at Barry, he directed the libraries at the University of Arkansas and District of Columbia of Schools of Law. Professor Ahlers served as President of the Mid-America Association of Law Libraries, the Southwestern Association of Law Libraries, and the Mid-America Law School Library Consortium. He was technical editor of the Washburn Law Review and has since contributed articles to other law journals. In 1997 Professor Ahlers co-authored Notary Law and Practice: Cases and Materials, published by the National Notary Association. In 2002, he published The History of Law School Libraries in the United States: From Laboratory to Cyberspace and in 2010 followed it up with a second book in his library history series, The History of Law School Libraries in the United States: Defining Moments, both published by William S. Hein & Co. Professor Ahlers has edited and contributed to numerous publications and served eight years as the Executive Director of Scribes, an organization founded to improve legal writing. He has served on more than two dozen ABA law school site visitation teams. Professor Ahlers is licensed to practice law in Kansas, Washington D.C., and before the U.S. Military Court of Appeals.